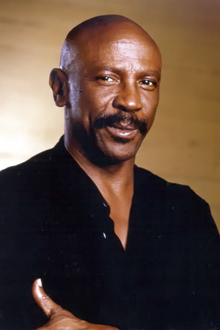 Oscar-winning veteran actor Louis Gossett Jr. will speak on racism in Hollywood and sign his newly penned autobiography. Scenes from his movies will be screened at the event, which is to take place Nov. 10 at 1 p.m. in Rapaporte Treasure Hall, Goldfarb Library. Gossett's autobiography, “An Actor and a Gentleman,” co-written with Phyllis Karas, chronicles the difficulties he encountered as a critically acclaimed African American actor trying to land leading roles, his subsequent drug addiction and recovery, and his later work — driven by his own childhood exposure to Jewish life — to help at-risk children. Gossett has a nearly life-long connection — of sorts — to Brandeis. The 74-year-old Gossett debuted on Broadway at 17. His latest film, “The Grace Card,” is slated for release on Feb. 25, 2011. It tells the story of two Memphis police officers and their journey toward racial reconciliation. These memories of growing up surrounded by a strong community, he says, have inspired him to set up the Eracism Foundation. In addition to the Schuster Institute for Investigative Journalism, sponsors of the visit include the Department of African and Afro-American Studies, Department of American Studies; Brandeis Black Student Organization; Cooperative Metropolitan Ministries; Department of Anthropology; Film, Television and Interactive Media Program; Hiatt Career Center; Office of the Arts; Office of the Dean of Arts & Sciences; Office of the Provost; Osher Lifelong Learning Institute; Peace, Conflict & Coexistence Studies; Social Justice and Social Policy Program; and the Interfaith Chaplaincy.